Profit from our years of experience in the travel industry and our attractive price-service ration. Regardless whether you register with our affiliate programme as a travel agency or website owner, with us you have first class earning opportunities with fair conditions. Registration is free and there is no minimum sales volume. Our agency support team is available to help on +44 20 336 533 13 or via e-mail at info-uk@traveltrex.com. You would like to integrate us on your website? You would like to sell our products in your agency? You would like to book a SnowTrex holiday? Here you will find all the necessary information about our special travel agent offers. 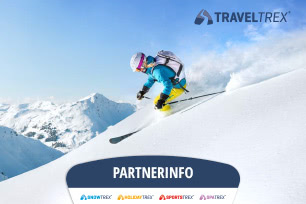 In our Partner Info, you'll find all of the important information regarding TravelTrex GmbH and its four brands, in particular SnowTrex, the largest brand:What distinguishes SnowTrex? Which target groups do we focus on? Which opportunities do we provide for collaboration? Who is already a SnowTrex affiliate, etc.